I used to think that parenting was the hardest job in the world. I no longer think that. I KNOW that! All it took was placing 700 miles between this mom and her kids to convince me of it. I will be the first to sing their praises and announce to the world that I have GREAT kids, but they are still JUST kids. Kids make mistakes. Kids have to be taught. Kids have to be corrected when they do something wrong. Kids need discipline and accountability. Kids require a lot of routine, consistency, and modeling. Now try to meet those requirements while living this far away from them. My morning started with a tearful phone call from my Allison. It then proceeded to a conversation with Blake that went back to Allie and then back to Blake once again. All of this before I even made it out of bed. I will spare you the gruesome details of the event, but if you look closely at the above photograph you might get the idea of how they behaved toward each other this morning. My heart sank as I listened to each side and realized that they had wasted what could have been a wonderful, enjoyable day out of school(they had parent teacher conferences today allowing then a holiday from their classes). How in the world was I to intervene, be just, serve the appropriate discipline, and set the example of consistency that I knew they needed to see all the way from Omaha? I counseled with them both, talked about their roles (that were defined by God) in our family, and let them know that I would be speaking to their father before he came home for lunch. Whatever punishment we decided to serve they both agreed would be deserved. So I left them to sweat it out until Dave made it home. After talking with Dave we agreed that an essay would be a good place to start. Neither of us were actually there to witness the injustice they served each other so figuring out how to discipline something we didn't see and didn't have the clear facts about had to be creative. What better way to spend their afternoon than sitting across the table from each other writing about the other one and what they appreciate about them. Our requirements? It couldn't be things like: "I like your hair." We wanted it to go a little deeper than that and we wanted them to really think about their relationship with each other. It also had to be two pages in length and had to be single spaced with their NORMAL sized penmanship. (After 12 years of parenting you start to figure them out a little bit and we knew that last requirement would have to be clearly spoken in order to avoid a kindergarten style paper). Ashley Kate and I went on with our day. I shed a few tears today over the separation of our family and I prayed for the children. Ash and I played and worked on her strength and advanced her feedings to 20cc and hour. We rocked and sang songs. I laughed at her silly attitude and I thanked God for the special hours He was giving me to spend with our youngest daughter. Although it is tough to be apart from Blake and Allison I can see that this time with Ash is precious and we get closer and closer each day. Tonight I received another phone call from home. No tears were shed by Allie or Blake. They were shed by me. As I listened to their essays about each other my heart soared with pride. They get it. They were able to diffuse the ugliness between them and truly seek to find the qualities in the other one that made them such a special part of our family. I laughed at some of the content. I cried at some of it. I laughed until I cried at parts of Allison's paper. That girl has inherited her daddy's humor! I wish I could share the papers with you , but I don't have them. I did ask Dave to save them for me because I plan on having them framed and presenting them as very special Christmas gifts from the other one on Christmas morning. I wouldn't trade my job as their mom for anything in this world. I have GREAT kids, even if they do still act like children(thats their job you know). I am truly blessed! I'm reading a book this week that was sent to me by a couple of ladies from home. I have never met them, but they know Dave and they sent a package with him to Omaha last week. I finished it today and the words inside of this book brought new meaning to me as our family continues this journey with our sweet Ashley. The name of the book is When I Lay My Isaac Down. I knew instantly that I would love this book. What a beautiful title! It is about unshakable faith in unthinkable circumstances and I will no doubt read it over and over again. As I read page after page I would say to myself, "I needed to hear that." As the author made comparison to Abraham's faith in his God I would say to myself, "I need to have that." One chapter in particular is called "Stretcher Bearers". While I read this chapter I was reminded by the author of a story in Luke that I remember learning as a child in Sunday school. I even remember coloring a picture and gluing the man onto his stretcher to take home with me. I hadn't thought about this story in many, many years, but as I read through this book it took on new meaning to me. Jesus was speaking one day and he was surrounded by a multitude of people. The crowd was so great that you couldn't even get through the door of the house to see him. A man who was crippled by a palsy was carried on a stretcher to the place where Jesus was. The part that touched my heart like never before was this, he was carried. By whom? Who would pick up this man who could not walk and make sure that he made it all the way to the One whom he believed could heal him? Not only did those "bearers" of his stretcher take him to the house where Jesus was, but they went to extraordinary means to make sure he got to see Jesus. The Bible tells us that when they could not enter the house because of the crowd they took the man onto the roof and moved the tiles so that they could lower him into the midst where Jesus was. When Jesus saw their faith he told the man, "Thy sins are forgiven thee." The man was healed. How beautiful! To have friends like that! To have a group of those surrounding you who would pick you up and carry you to Him when your could not reach Him on your own. They were literally his stretcher bearers. They bore the weight of his burden and carried it to Jesus for him. Before Ashley Kate's birth I would have never seen this part of the beauty of this story. I saw that Jesus healed this man. I saw that his faith made him whole, but I missed the part about his friends. Those who got him to Jesus. I think this part of the story is beautiful! Oh, to be that type of friend. I may have never felt the importance of the role that these "bearers" played in this man's life. Now I can say that through her life, her struggle, her battles, and her triumphs I know exactly what those stretcher bearers must have meant to this man. I have been picked up and carried to Him. My burden which seems so heavy some days as though it might crush me is carried to Jesus by those of you who chose to come along side of me and carry my "stretcher". When you are given the opportunity to see those around you become the physical hands and feet of Jesus you will be forever changed. I pray that I will not forget what He has taught me though each one of you. I pray that I will someday in someway be able to do the same for others. What a blessing this book has been to me the last couple of days. the lovely trees of fall created by my sisters first and second grade classes. Ashley loves the trees and the many colored leaves. I love your notes of encouragement. Thank you boys and girls. those who sent me this book. I was so encouraged and blessed. the one who sent the "HUG" last week. It is beautiful and I love it. the adorable hair items that were sent to us girls. I never found your name anywhere on the package, but I want you to know we loved them! my sweet friend who stopped by tonight a gave me the opportunity to "snuggle up close" to my family as I drift off to sleep. I still cry each time I glance over at it. Thank you. those who joined in prayer for us last night. 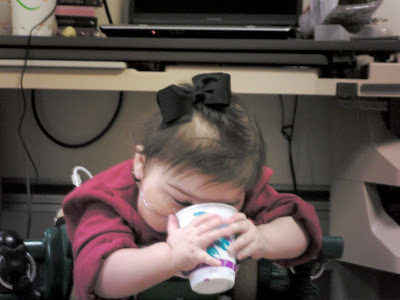 Ashley was weaned off of her oxygen this afternoon and no one can explain why or how? (That always makes me smile.) Your prayers spoke to my heart. each one who gladly accepts the difficult task of "bearing our stretcher" on those days when I am too crippled to take myself to the place I need to be. I know what a tough job that is. Rewards can be SO Refreshing! We got up yesterday morning and decided that today would be the day. Out of bed, too little oxygen or not, throwing up or not, we would get up and face the day as if we were at home. Out came the play mat, all our toys, books, and the dreaded gait trainer. It was Ashley's first time in it in 7 weeks and I knew it probably wouldn't be too pretty. At first her little legs shook because they had become so weak, but it didn't take long for her to put her determination in motion and go get what she wanted. I realize it was only one push away, but this push spoke VOLUMES to this mom's heart. She remembered what it was going to take to get to where she wanted to go. This was her first successful attempt. I thought it would make great video, but the throwing up at the end of her drink didn't look that good once I viewed it. So I decided to just share the pictures. I knew you would appreciate me for that (especially those who are reading on their lunch break!). She did this 3 whole times yesterday! I remain encouraged. Yes! She did it all by herself with no help. I am so proud of you Ashley Kate. Your baby steps will get bigger and bigger someday. I love you! So refreshed. She kept drinking and drinking and drinking until... well, I promised not to show you what she did next. The point is she earned that refreshing reward all by herself and I couldn't be prouder! Thank you so much for the time spent in prayer for us tonight. As I stood by Ashley Kate's crib lifting her up to the Father I could feel the presence of many inside my heart. You will never know the impact you have made in our family and in the life of our little girl. This was my very first image of this years fall. My first day outside in almost 7 weeks. Oh, how beautiful to spend the day outside enjoying all that the Father created along with two of our three children. Friday after rounds Dave and I took Blake and Allie to the pumpkin patch here in Nebraska. If you have never been to the pumpkin patch in Nebraska then I dare say you have never "really" been to one. I know I hadn't. The weather? Lets just say that living in Texas the majority of our pumpkin patch pictures have been staged. Through the years I have been known to "force" our family into sweaters and jackets in nice fall colors just to capture that fall like feel in our photographs. All the while the sun was beating down on us in about 90degree temps causing most of us (including me) to be miserable by days end, but oh the pictures I have taken. This years pictures are AUTHENTIC! The children had to keep jackets on in order to enjoy the day. I had to borrow a pair of tennis shoes so that I didn't freeze my toes off in my flip flops. I think the temps were around the mid 50's and it made for a perfect day of running around the amusement park, I mean the pumpkin patch. It was as big as an amusement park with just as much to do and enjoy. What a great time we had together. How I wish our "Pumpkin Pie" ( a new nickname one of the x-ray techs gave our Ashley Kate which just made me giggle) had been with us. When we asked if we could bring back a pumpkin in order to take some pictures of her with it and to let her touch it we were quickly told "NO!". So much for trying to be polite and ask. Next time I will just do it and let them chastise me for it later. So after all our wishing and hoping Ash did not get to see her first pumpkin. They told me to bring her a plastic one. Like a plastic one from the shelves of walmart that has been touched by a thousand hands was going to be any safer? We decided we would just have to wait another year to let her see one of those big orange circles. I'm afraid if I shared with you all that we did this day you would be reading all night. So instead of boring you I will attempt to hit the highlights. What is there to do at a pumpkin patch other than pick out a pumpkin? Paint ball. Pig racing (you would just have to be there to understand). Pumpkinopolis 5000 cart races. Gemstone Mining( Allie is an avid rock collector and we really enjoyed mining for stones. Dave and I have decide to sneak one of the emerald stones out of her bag and have it set in a ring for her for Christmas this year. I can't wait!). The Cookie Coop(Blake's favorite event of the day. An entire cone of warm, fresh, from the oven, gooey, chocolate chip cookies to warm your tummy. He was in Heaven and couldn't stop smiling!). Pillow jumping. Apple launching. Pumpkin cannons. Pumpkin eating dragons. Mazes( we all choose a different entrance and raced to the end. Who do you think won? Of course it was Blake.) Cotton candy, Carmel apples, chili, corn dogs, smores, campfires and anything else you can think of to make the experience last a life time. We truly had a great time just being together. In the back of our minds and always in our hearts remained our baby gherkin and a longing to have her there with us. Things just aren't as precious when we are separated, but still we remained thankful for the time we were given to enjoy a fun filled day. I long for the days when she is back out of the hospital and living life with us once again. There are days when I feel as though we are drowning. Every day seems to bring its own set of struggles for Ashley Kate. This morning she just needs air. Simple everyday, in and out, oxygen. Most of us never even think about taking a breath. It just happens for us naturally. Today Ash is having to work for each and every one. This can get so frustrating for her and for me. She is on oxygen, has had a breathing treatment, a chest x-ray, and we just sent a viral panel from her nasal washings. All of this before noon and before rounds. I feel as though we need to string together one or two good weeks with no issues and then we will be on our way home. The trouble in that plan is getting those one or two weeks. At this point we have the ability to string together one or two days but past that it just isn't happening. Yesterday marked 7 weeks of vomiting for Ash. There is no clinical indication that we have been able to find anywhere that is causing the vomiting. Since she doesn't show a reason for it then no one is concerned about it. I was told other than the inconvenience of it there is no reason to worry about it. Ash doesn't inconvenience me in any way, and as long as everyone thinks she is safe then I will try and stop worrying about all of the retching, gagging, and vomiting. Despite our respiratory issues, I think she is doing well. She is currently on the floor on her play mat surrounded by her books and a basket of toys. We have done some work on her tummy, and some standing work. She has become very, very weak the past month and half. Her little arms and legs shake and shake as we attempt to re-gain the skills she had acquired. Dave and I have done some reading and some research as we are looking into some program options for her. 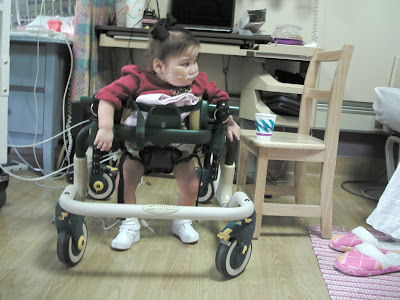 We truly believe Ash has the potential to reach her milestones and to live a somewhat normal life. We also believe that she has suffered some mild injuries to her brain and its development. Not only in utero, but also over the course of her surgeries and transplants in the past two years. We read something this weekend that brought new hope to our hearts and a re-newed drive to help her overcome. "Believe in your child and their potential. You have nothing to lose." That is the key to her success. If we don't believe in her and put the drive to excel in her then no one is going to. We firmly believe God has a plan for Ashley Kate. There are days when it becomes difficult to see past the current circumstance, and then there are those days that He allows us to be encouraged by something new Ash learns or does. Ashley Kate is no longer in rejection, but we are facing a whole set of side effects and current struggles as a result of this episode. If we could just get to the place where she is back home, living life, working with Ms. Sue, and playing daily with Blake and Allie, then I think we will see drastic changes in our sweet girl once again. Your continued prayers for her recovery are so appreciated. I would like to say that we are days away from returning, but the likely hood of her surviving the RSV,cold, and flu season in the hospital are not very promising. We had hoped to be moving her into the cooperative setting away from the other patients and the traffic flow today, but her respiratory distress this morning has put a halt to that plan. Over the course of our visit, I had the opportunity to talk one on one with Blake and Al about Ash and our family. Just touching base with them and their thoughts about this latest separation. Allie and I were loading Ash and her pumps, and tubes, and machines, and IV pole in the wagon to go outside for a few minutes and I light heartedly asked, "Is she even worth all this nonsense?" To which my Allison replied, "OF COURSE SHE IS, MOMMY! She's my sister." A couple of days later Blake and I were in the car alone and we began to talk about Ash. I asked him if he thought we were making the right decisions for her or if he would do anything differently? He wondered what could we have done differently. I shared with him that some people think we made the wrong decisions for our family and for Ashley. This is how he responded to me . "Mom, I think thats why God gave Ash to us. He knew we wouldn't quit on her and He knew we would do anything for her even if it was hard. If somebody else would have taken her then they may not have tried so hard and she deserves for us to keep trying. This is what we do and I would do it the same way you are." With tears running down my cheeks I told him with all the sincerity in my heart that I loved him and could not be prouder of who he is. He just shrugged his shoulders and said, "Thanks, Mom." It goes so fast! When I was a kid it seemed like the days could drag on forever, but now that I am a mom the days begin and then end before I am ready for them. Dave and Al have just arrived at the airport and are waiting to board their plane. Blake and Grandma flew out early yesterday morning in order to make it in time for the Tarheels first game at 1:00 in Dallas. As I hugged that handsome ballplayer goodbye I think I might have held on a little tighter than I usually do. He is just so wonderful and I wasn't ready to say goodbye. Eventually I let him go and its a good thing that I did. Our Tarheels went 2 for 2 yesterday winning 11-1 and then 18-1 ranking them 4th to enter into todays tournament play. They won again this afternoon 5-4 in an exciting game and are now preparing to play in the Super Series State Tournament semi-final at 5:00. Dave and Al should be able to catch the last couple of innings. How I wish Ash and I could have jumped on that plane with them! Our week slipped by so quickly. There was just too little time. We tried to pack in as much fun as possible during our 4 and 5 days together(shopping, pedicures, paint ball, pumpkin patches, games, movies, date nights, wrestling matches, wagon rides outside, sock wars and crafts). Ash had her best day Wednesday and we are so thankful for that time. She laughed(as you saw on our video) and played and loved on Blake and Allie all day. Then Thursday and Friday she just felt bad. Very few giggles, but lots and lots of foot rubs! It didn't take long to train her brother and sister. All she had to do was put up a little fuss and hold that foot in the air. Two seconds later I would see one or both of them with a tiny pickles foot in their hands as they visited with her and told her how very rotten she was. Yesterday we awoke to great news. They had suspected she might have slipped back into rejection and we waited anxiously for our biopsy results. ALL CLEAR! She was the only scope that produced good news that day. We couldn't be more thankful! Her CT scan showed some loops of bowel that had some thickening of the walls(this is not good and we will have to monitor it closely), but it also showed a complete resolution of the nuemotosis. That meant that we got to start her feeds back today running at 10mls an hour. Literally 2 minutes before Dave walked out they came in and pulled out her chest tube. It was in for a full 2 weeks. She screamed and put up quite a fuss, but after a little morphine she has drifted off to sleep. So much has happened this week. Lots of anxious moments and days, but the good news is that she is on feeds again and this will be our ticket out of here! Walking into the room to find our 12 year old son laying next to Ashley Kate on her pallet. Hearing Allie say, "Whats wrong baby pickle?" I guess Ash will always be a baby gherkin to us. Watching Dave climb his old body in to that crib next to our baby. Seeing Blake dance along with Steve on Blue's Clues just for the entertainment of his baby sister. Listening to Allie read stories to Ash while standing on a chair just so she can see her. Taking Al to get a manicure and pedicure this morning. She is really growing up. Seeing the protective glances on the faces of her amazing brother and sister each and every time someone comes in her room to do anything to her. Taking Ashley Kate for a walk outside for the first time in 6 weeks. Making up songs and games together trying to get Ash to smile. Watching Ashley show off her new skill of holding up two fingers so everybody knows that she is still 2. Being with my son to watch the first game of the 2007 World series! What a blessing. Seeing my three kids all in the same room at the same time. It doesn't get any more precious! Sitting next to my best friend in all of the world tonight at dinner and discussing our hopes for Ashley Kate's future. Emotionally I think Ash is doing very well the past two days. She is so happy to be surrounded by her family. Medically I am not so sure. Her CT scan showed complete resolution of her numetosis and for that we are grateful. It also showed a larger collection of fluid around her heart. Another echo cardiogram was done this evening and we wait for direction. They have not allowed her to have any feedings in case action needs to be taken. Her stool output is very, very high and they are considering another scope and biopsy of her bowel to be done tomorrow to check for rejection. Her nausea and vomiting continues, but she no longer has fever. She looks uncomfortable today. Her face is swollen and puffy as is her tummy. This is not an easy ride. How we wish to pack her up and take her home with us. The majority of Ashley's symptoms are a direct result form the many medications she has been started on. Originally they were needed to stop the rejection, but one led to symptoms causing need for another and another and another. The fluid issues in her lungs and heart are very dangerous and they have been caused by one of her medications. What a trap we find ourselves in. Her chest tube remains and it has been in for almost 2 weeks now. In the beginning I was told it would be there for only a couple of days. Her kidneys have slowed done and are causing much concern for everyone. If we could only get back to where we were at home. Our goal is this: get her out of rejection and stay there. Get her home. Get her off all of these medications that are causing this trouble. We have a ways to go, but we are still confident we will get her there. Thank you so very much for your continued prayers for Ash. We really appreciate each one of you. She sure is having a good time with her Daddy, Blake & Allie. Its CRAZY how much I miss you guys when I have no access to Ashley's Journal. Dave walked in at 7:30 this morning and here I am. I knew I loved this guy! Thanks Babe! I am so CRAZY blessed in this life. Each day I look around me and make it a point to acknowledge my blessings. Yesterday I didn't even have to try and look for them. They just kept falling all over me. I tell you it was CRAZY! Our day started with the news that we would be moving out of the PICU. The next thing I new we were clamping Ashley's tube off and that meant we were making progress. Then around 6:30 we got to "move". Thats when the blessings started falling all over us. We walked into the biggest room we have ever had. What in the world did I do to deserve this? Nothing. Its just because He loves us. Next, I walked a little further into our room and guess what I found? A BED! A real life, honest to goodness, lay all the way down flat BED for ME. Did you read those last two words? FOR ME? I am so CRAZY blessed. The nurses who prepared the room for us are such blessings. They said, "We thought you might like to have your own bed so you don't have to sleep in the chair." I love these girls. They also made sure we had a "good" recliner to rock in, and what I call the "rolly" table(you know the hospital bedside tables on wheels) for my office. Then they said, "Were gonna step out of the room and allow you to move things around the way you like them." That made me giggle because they knew I would have to organize my different "rooms" for Ash and I to live in . Then this morning a group of the most beautiful people I have ever seen in my life walked through the door. They looked amazing. Blake and Al are SO grown up. I missed 'em like crazy! What did I do to deserve to get to be there mom? I am so blessed. At this moment they are dancing around the room and entertaining Ashley Kate. She sits on her daddy' lap giggling, clapping and waving her arms for "more and more". She is so happy! and I am so happy to see them all together again. I am crazy blessed in this life. As far as the progress goes, Ash is struggling with her feedings. I think they will probably be stopped today. She has been throwing up all morning. It doesn't seem to bother her. She just vomits and laughs and vomits some more. A little nausea isn't going to stop her from enjoying this visit. I'm a little disappointed, but it looks like she just isn't ready yet. We will have to see what the CT scan shows tomorrow. We are also waiting on the chest x-ray to show us how much fluid has re accumulated in the lung area. If it looks good we might be able to get rid of that chest tube. Ashley actually tried to pull it herself last night. It wasn't pretty. It took a team of 5 people holding her down, a dose of tylenol, benadryl, and morphine to secure it again. She fought and screamed like I have never seen. 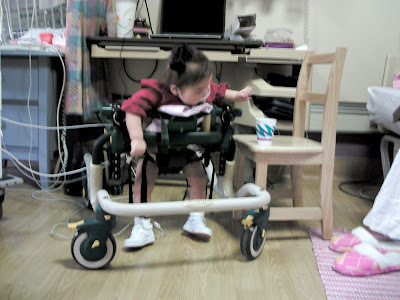 The blessing in this whole ordeal was that she showed us that she indeed can be mobile and get anywhere she would like to when she wants to. We could not keep her on the bed. She fought and crawled and scooted and moved so quickly we kept having to get more people to come in and help hold her still. This baby is going to get mobile someday. I just know it! ..of the PICU. We are getting to move up to the regular Pediatric floor today. YEAH!!! I had prayed that we might be out of ICU when the kids got here. I had also prayed for her chest tube to be removed so that they might hold her. Were not getting the tube removed, but we are getting to clamp it off and see if she can do it. Thats progress, and thats a blessing to be counted. I am so excited to be getting to go back up where the rooms are larger, quieter, and more private. This is such good news for us and it came just in time for our visit. So I am packing for our move. For some reason Cheerios just taste better up there. I am so excited! Overall Ash is handling her feeds well from what I can tell. She continues to hold on to a low grade fever and seems nauseated when she is moved or picked up, but I think all of that is to be expected. We have a CT scheduled on Thursday to see what she is doing with those feeds. Hopefully her bowel will look beautiful and show that the numetosis is all resolved. She fussed and fussed at me for most of the morning until I figured out that she had been reaching for her sippy cup. That baby was thirsty and wanted a drink, so like any compassionate mommy would I filled that cup with water and let her drink away. Who needs to ask anyway? She is now sitting happily in her crib with her cup and life is getting better for her. Just wait until tomorrow when her daddy and Blake and Allison come walking in! I'm not trying to get greedy or anything, but I have been secretly hoping to have our "freedom" re-established this week so that we might be able to take her outside and let her carve a pumpkin or something with Blake and Al. This move upstairs makes that a lot more of a possibility. Please, please let this happen for her. I just know she will feel so much better once she goes outside and feels the cool air, sees the sunlight, sticks her hands inside a pumpkin for the first time, and gets to play. Its funny how important the little things in our life have become since Ashley Kate's birth. I honestly don't know how he does it. This man must feel as though the weight of the world is on top of him, but yet he never lets me know if he is struggling. I crumble and fall apart all over him several times a day, and he never fails to encourage me and bring me back together. He can make me smile even on the toughest of days. He brings laughter into our home, our family, our relationship and thats what makes our life so great. Without his strength and his solid perspective I could not do this another day. I love him. I admire him. I respect him. I am thankful I get to know him, and even more thankful I am allowed to love him. Once again he has put the pieces of my fragile heart back together and has encouraged me to keep on. His strength, and peace, and comfort comes from God. With all that he is managing in my absence you would think I would be the one to lift his spirits, but it is the other way around. All I do is Ashley Kate. He does everything else. Our home, our practice, our family, our life continues to run like clockwork because he is amazing and he works from early in the morning until late at night making sure things go right. After working a full day at the office, giving a lecture, settling the children and tucking them into bed, he is up packing for the trip. Tomorrow morning he will attend Allison's field trip with her and her fourth grade class, work a full afternoon at the office, and then jump in the car for a 14 hour drive. He will do it all with a happy heart and a willing spirit. Why? Because he loves us. He loves me. He loves our family. He loves our baby gherkin(and can't wait to hold her!). He loves God. Thanks Dave for having the energy to encourage me tonight and for having so much excitement in your voice about coming to visit. I love you for keeping me centered and for allowing me to fall apart all over you. I can't wait for Wednesday morning! Ash is still on her feedings. She doesn't feel well today and I am trying to imagine what it would feel like to use your tummy and your bowel for the first time in 35 days. I think I might feel a little yucky too. She has spiked a low temperature tonight and her heart rate is a little higher than I would like. She has been nauseated and thrown up several time today, but I think that is to be expected. Overall she is holding her own. When I pick her up she snuggles in under my chin and pats my arm with her tiny fingers reassuring me that its going to be alright. She has not slept much today and even though she looks exhausted I don't think she is going down tonight either. Her chest tube continues to put out way too much fluid. She is losing about 100cc every 6 hours. She has to get down to 30cc in 24 hours before they will pull it. Her side is sore and bruised and she screams any time you touch it. I have learned to pick her up in very interesting ways this week in an attempt to make her more comfortable. If we could ask you to pray without publishing the details, then that is what I would like to do. There is much tension and stress in our room today and I would greatly appreciate your prayers. I rest assure knowing that God knows what is going on and that He is working His plan, but it is a difficult day for me and I am facing difficult decisions. Ash is currently doing OK on her new feeds. Not great, but not too bad. The best I can report is that they are going ok. She is very clingy and cuddly today and it doesn't really bother me. It just gives me more opportunity to rock her and be close to her. It's been 5 weeks today since our sweet Ashley had gotten sick. 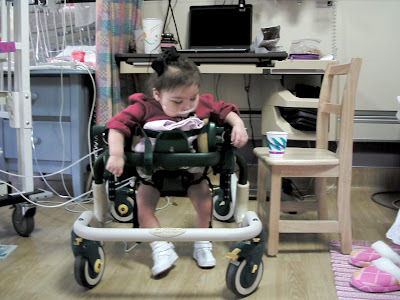 We took her into the hospital for what we thought would be an overnight observation while she received some fluids. Little did we know that our tiny pickle would not come out, but would actually be sent back to Omaha. The early weeks were filled with heart break and disappointment, fear of major surgeries and the diagnosis of rejection. What a roller coaster of emotion. Today our little one returned. Full force. She has smiled, played, giggled, sparkled, and brought such joy and encouragement to our hearts. I saw Ash in her eyes for the first time in over a month. She was silly and ornery. Refusing my kisses and shaking her head "no, no" each time I asked her if she loved me. She would lean her forehead into mine as I would say, "I love ya, love ya, love ya!" To which she would smile that amazing smile and cut those twinkly eyes. I truly do love this child. What joy she brings! My heart is encouraged. Although she struggled this past month, she held on to her spirit and today was the day for it to shine. So what is our exciting news of the day? Ashley Kate is having dinner tonight! That's right, we have just hung her first feeds in exactly 5 weeks today. Our sweet baby has not been fed in 35 days. Her bowel has suffered much injury in the past 5 weeks. It has come out of rejection and is still healing from a severe case of numetosis, but tonight is our trial run. We have started with a "thimble full" of neocate to test it out. Although I am SO excited to be at this place, it could possibly be a dangerous place for her. We have no idea what her bowel will do with the food we are trickling into it. Will it absorb? Is there motility enough to move it through? Is the numetosis infection healed enough not to react to the feeds and flare back up? We just don't know. 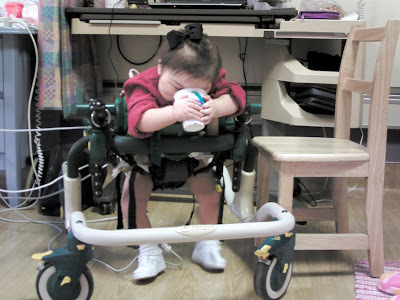 What we hope is that she does not become sick, does not become distended, does not vomit, and does not spike a fever. We need for her bowel to do its job and do it well. This is our first step toward making our way back home to Texas. I was so surprised to find out we would be taking it tonight. If her bowel does not react the right way then we are at great risk of developing another case of NEC. NEC is the original condition that led us all the way into transplant life. If her bowel allows the formula to sit stagnant inside without absorption or motility then bacteria will set in and could possibly cause the tissue of the bowel to necrose or die. That would be disastrous. We have decided to keep her antibiotic coverage going just in case this occurs in hopes of protecting her against bacterial infection. Excited and anxious. Thats is exactly where I find myself tonight. The Tarheels won the tournament tonight. The second game was 13-3 and the third was 10-1. Yeah Tarheels! We are so proud of you guys. To top it all off, the Red Sox are on their way to the World Series against the Rockies. Now who are we supposed to root for? I can feel a division in our family rising up. She's just learning to take it all in stride. Ashley Kate is no longer stressed out about being here. She has stopped grinding her teeth and she no longer screams every time someone approaches her bed. This is what she is up to today. She's just kicking back while mom does her laundry. Looks like she's on vacation! I am so very proud of this baby. She is growing up! She has learned the drill. Every 4 hours they come in and she puts her leg in the air and allows them to put the blood pressure cuff on without throwing a fit. When she sees the thermometer she no longer fights to keep her hand behind her head. She throws that arm down to her side and allows her temperature to be taken. She doesn't do it with a happy heart, but she does do it without a fight. The look on her face says a thousand unpleasant things, but I won't try and interpret them. I'm sure it wouldn't be polite reading. The point is that she is maturing and learning each and every day even in this environment. I think she looks great today. It was a rough night, but she woke up in a great mood and has been sitting up in her bed for over 2 hours now. She is looking at her books, playing with a couple of toys, and watching you know who. We will not be taking the drain out of her chest today. She put out 120ccs in 12 hours last night. Where in the world is all of it coming from? We have removed close to 1000ccs of fluid of her left lung. The blessing in all of this is that she can breathe easily with it in. How grateful I am that she is able to breathe without any support. I know the tube is uncomfortable for her, but without it we would be in a lot of trouble. So today I am trying to be thankful for the hole we have cut into her side because it is allowing the extra fluid to drain out rather than having it put her in danger. Its all about perspective in this place! On the home front, Allison's soccer team entered today's play ranked in the first position. They lost their first game which knocked them down to play for the 3rd or 4th place overall. After an exciting game(which I listened to by phone) they won 2-1. The girls were thrilled to win a medal and we are so proud of Al! The Tarheels won their second game last night 5-4 and began today's place ranked in the number 2 position. Their first game of today was 13-3 by the Tarheels and now they get to play at 4:00. Go Tarheels! I have exciting news to share with you later on tonight (if it actually happens). I don't want to say anything just in case it doesn't, but if it does I just know`you will be smiling as big and wide as we will be. Michelle J- the mezuzza arrived for Ash yesterday and it is precious. Thank you for your thoughtfulness. Emily- We received your letter and Alivia's stickers. I can't express how very touched I was that you thought to share them with Ash. Your Livi was beautiful, and I am so thankful the Father allowed you to be her mommy. You are being prayed for. By the world's definition a life of service may not seem so glamorous. Too often I think we are told that we "deserve" to be served rather than to serve others. I disagree. Strongly. How honored I am to be placed in the role of servicing those who I love. We as moms are so very blessed. Thats not to say that it is always an easy thing to do, but today I tried to concentrate on the rewards of my service to my family. As I rocked my sweet Ashley I was richly rewarded. How amazing to feel her tiny heartbeat against my chest. She had relaxed and curled into me and I stopped and just enjoyed each beat of her heart. The smell of her freshly shampooed hair was delicious and the way her baby soft skin felt overwhelmed me. To be honest, yesterday was hard. I tried so hard to soothe the aches of this tiny baby for so many hours that when I woke this morning the muscles in my legs and hips burned. They still hurt as I sit here tonight. Talk about service. I joked with my friends last night that I must have had a spring installed when I wasn't looking, but the reward is so very sweet and satisfying. I am blessed to have this opportunity. When I consider all the times I get to serve my beautiful Allison Brooke the service pales in comparison to the reward. Our friendship blesses my heart. To feel her little hand reach out to hold on to mine as we walk. I love that she wants to just "touch" me. She lays awake each night waiting for our time together. Sitting on her bed, listening to her prayers, kissing her forehead as she drifts off to sleep. Priceless are the rewards I am given in return for my service as her mommy. I will gladly make hundreds of grilled cheese sandwiches, brush thousands of strands of her hair, and wipe the many tears that fall onto her cheeks(because she is nine and nine year old girls are VERY emotional!) during these years. My son. Serving this child is a joy. From the moment he was born and I became a mom I have been so blessed. Washing the many uniforms, packing his equipment, rubbing those smelly feet. All in return for the most beautiful words I have ever heard, "I love you more than chocolate chip cookies mom!" What a reward! Feeling his arms wrapped around me as he passes by and stops to give me hug. Crowding behind me on the couch to watch a baseball game together. Answering the phone while I am 700 miles away to hear, "How are you mom, this is Blake. I'm just wondering how you and Ashley Kate are today?" A life of service? Is it daunting? Is it demeaning? Absolutely Not! It is a blessed role I have been chosen to play in this life. A life of service is an honor not a burden. These are just a few of the rewards I receive for my service as their mom. I couldn't imagine a better life. Ask me this question: Would you rather be served or would you rather serve others? I would gladly say, "Sign me up for a life of service. Nothing could be more satisfying." Rounds are now complete and if you haven't noticed by now things tend to move slow around here on the weekends. Here is the news. We still have our chest tube. Ash needs to have less than 30cc out in a 24hour period. The last 24 hours she had 80cc out. So the good and the bad of this situation? The good is that her doctors are very cautious and are not removing it too early causing them to have to turn around and put it back in. I am thankful for that. The bad? She hurts and is uncomfortable because of it. We are also stuck in the PICU until it is removed just in case it were to pull loose and allow air to rush into the space. The resolution of Ashley's bowel is also moving slow. Until it resolves we are not going to begin any feeds. It shows that it is happening so that is encouraging, it is just happening slowly. Hopefully by the end of the week we will be able to "test" her bowel with a little amount of feeds. We won't know how it functions until we can feed it. The surgeon on service this weekend is not supportive of us going home before she achieves full feedings. If they all feel that way then Ash and I could be here a very long time. I think I am switching my prayers to include achieving that full feed status sooner rather than later. This will be our key to getting home. Allison's soccer tournament is going well. They won their first game 7-0. They won their second game 5-0. They will play the third game tonight at 5:00. The Tarheels will begin their first game of the weekend at 4:45 this afternoon. Blake is traveling with friends of ours and Dave will join them tomorrow evening if the guys are still in it. Ash is very tired today. She had a restless night and actually slept in until 2:00. She is already trying to go back down for another nap. I am hoping to keep her awake by reading some books together in the rocking chair as we listen to "Anne". I don't want her days and nights to switch around on us. So once again we proceed slowly. In some ways I feel as though we have been thrown back into those post transplant days. In other ways I can see how much bigger and stronger Ash is this year and it keeps me encouraged and looking for that quick turn around that will lead us home. Only 4 more days until Dave and the kids arrive, and we can't wait! Tonight I am thankful for the brief moments of play, rest, and friendship the Lord gave to us today. It has been a tough, tough day for Ashley Kate. She has been so uncomfortable for most of the day and night. Nothing I have done helps to ease her discomfort. I really think that once the chest tube is removed she will feel much, much better. Hopefully that will take place tomorrow. Even now she struggles to rest. As I said earlier I am concentrating on the good things that happened for us today. We did play for a brief moment or two(not lasting for more than ten minutes or so). We did rest for a brief time this afternoon. The only sleep she has had since 5 this morning. She has wrestled with her drain all day long not allowing herself to sleep. We did have visits from friends today. That was such a blessing. In those brief moments we laugh and try to forget the heaviness of the day. What gifts of friendship the Lord has given to us here in Omaha. We are both so tired from today. I was constantly trying to make Ash more comfortable. We would rock for brief moments, walk for brief moments, sit for brief moments, and then lay down for brief moments. I describe them as brief because none of them lasted. She just aches and I am left helpless. We spoke with Dave and the kids briefly tonight. Blake was going to bed because he has a baseball tournament tomorrow in Lufkin and Allie has a soccer tournament tomorrow in Longview. Dave was already asleep when I called as well. He is so tired from all the running he does with the kids after work. Tonight they made dad's famous pumpkin seeds and I know they enjoyed that. They absolutely love this time of year because of all the special treats that come along with the season. Last night Nan made them frito chili pies after ball practice and they enjoyed that as well. I can't wait for Ash and I to return home so we can be a part of all that is going on. Speaking of brief moments, we are still praying that our time here will be be brief. It has been four weeks now and I know we will be here a minimum of two more. We still keep count of the weeks until Christmas hoping in our hearts to be back home in time to celebrate. We have held on to that same hope for the past two years and did not make it, but perhaps this will be the year that we do. I have no time to waste. Not a single moment. He has given me, entrusted to me, one of His most valuable creations. When I stand before Him I want to know that I refused to "hide" my "talent" for fear of losing her. I want to know that I did everything to make her life full, rich, and well lived. I want there to be NO regrets. Jesus told of a parable in the book of Matthew. There was a master who was going away. He called unto him 3 servants and handed them each some of his talents to manage in His absence. The first he handed 5, the second 2, and the third 1. When he returned the first servant showed the master that he had taken the 5 talents and doubled them for him. The second servant did the same. The third servant returned unto the master the 1 talent he had been given to manage and said he had buried the talent out of fear of losing it. To the first two servants the master answered, "Well done. I will make the ruler over many things." To the third servant the master said that he was wicked and lazy and he took the talent from him and gave it to the servant who had ten. Jesus goes on to say many other things about this parable in Matt. 25, but what spoke to me the most was the fear in the third servants heart. I do not want to be that servant. I want to know that I made the most, the absolute best that I could, of Ashley Kate's life. Dave and I have made it no secret that we don't expect our sweet Ashley's life span to be the same as our Blake and Allison's. We have acknowledged that our time with her may be short. With that knowledge we feel the urging of the Holy Spirit to enjoy each moment, each day, each experience with her so that some day we can stand knowing that we loved her, we shared her, and we dedicated her unto Him. Because of this urging we also don't expect to attain perfect heatlh in her body before returning home with her. Our goals are more realistic than that. We want to achieve a safe place. Once we are there then we will work on TPN, feedings, replacements and the like. All of this can be done in our home, with our family, living life to the fullest extent possible. No regrets. Afternoons at the park, picnics by the pond, trips to the ocean, bike rides around the block, baseball games, Christmas with her cousins, and all the rest. This is our current prayer for our Ashley, a safe place. This morning we are encouraged and a little disappointed. Encouraged becasue CT shows more resolution of the damage done to her bowel. Discouraged because it is not healed enough to begin feeding it. Encouraged because we may still leave the PICU today. Discouraged because the drain tube must stay in her chest another day possibly two. Encouraged because she is here with us for another day. A little discouraged because our time here is to be lengthened by another week of waiting before beginning her feeds. We are doing our best to return unto Him that which He entrusted to us with full knowledge of knowing we did what He led us to do. It is with this prompting that we seek to live and to give our children the best life possible. That is especially true of our littlest one. Oh, to hear Him say, "Well done" when it is all over. This is not all there is. She is oh so much more. More than hospital beds. More than monitors. More than leads and wires. More than meds. More than scans, and tests, and procedures. The Father has so much more in store. Some days it becomes difficult as her mommy because while we are here she is "just Ashley". She is known as the patient, but they don't see the little girl. She is known by her chart, but not by her heart. I want so badly to announce to everyone that she is more than what they see in front of them. What they know is our Ashley on her bad days, but if they only knew our Ashley on the good days. If they could see her laugh the way she laughs when she plays with her daddy on the floor. If they could see the twinkle in her eyes each afternoon when we open the car door for Blake and Allie after school. If they could see the wonder on her face as she sits with her Nan on the front porch to watch the birds take a bath. If they could feel her tiny arms wrapped around their necks with all the love she can muster then I know they would get it. She is so much more than the patient. She has a life. A home. A church. A community. A family. Ashley has spent some of her life confined to a hospital room, but I wish everyone could see her on the days when she is not. She lives. She plays. She loves to be outside. If you could see the look on her face as she watches a butterfly fluttering in the garden. Or if you could see how intently she watches Blake throw a ball. How about the way she claps her hands when Allie "rescues " her from her crib. Nothing is sweeter than to see her sleeping on her daddy's chest while he naps at lunch time. Oh, how amazing it is to feel her relax into my chest as we rock. I know in my heart the Father has so much more planned for her life. I know she will do more things. She will see stand on the mountains and behold the beauty He created . She will play in the waves as the ocean breaks against the beach. There are many sunsets she has yet to see. Raindrops she has yet to feel on her face. Leaves she will run through. She will learn and grow and experience more and more and more. I believe this. This is only a time in her life. It does not define her. She is so much more than what they know. She is our daughter and she is so very special. Its easy for some to think we have "put " her through all of this. Perhaps they have missed seeing the twinkle in her eye, the fight in her spirit, the smile on that beautiful face. Perhaps they can't acknowledge the value in His creation. Perhaps they have closed their hearts to watching the hand of the God who created her work in her life. I don't know how they fail to see the miracle of who she is? It astounds me that someone would choose not to see that there is so much more going on here. My heart breaks because they have chosen to miss out on that so much more. What would the Father have done in their hearts had they only opened them up to this little girl? ...You just have to live a little. Enjoy! Forgiveness is easier to get than permission around here. Hope you understand. Our day began around 4a.m. Ash woke fussy and uncomfortable and has remained that way. Up until that time I feel like she rested fairly well. She tolerated her vitals being taken throughout her IVIG infusion and even slept through some of them. At 5:30 x-ray came rolling in and I thought, "Well at least were already awake this morning." Then it was time for labs to be drawn, and the day took off from there. Hospital life is tough on little ones. Their sleep is interrupted constantly and they never quite get into a routine. I managed to stretch her tubing far enough to reach the rocking chair, but it didn't help. Her chest is sore from the drain and she is no longer tolerating it. She picks and pulls at the dressing trying to get to it. The doctors would like to give her a one time dose of morphine to help her get through this period today and hopefully get her some rest. We are not removing the drain today. We all had hoped for it to stop draining by now, but it hasn't. It is slowing and that is good news, but not enough to remove it. She will have to keep it for at least one more day if not two. We will be turning it off of suction and onto water seal today to see if that helps it to stop draining some. She can't wait for it to be gone. We are taking her down to CT today to look at the bowel. We are hoping to see that the nuemetosis(?) has resolved enough to begin some feeds. Unfortunately she continues vomiting and until it stops as well we are stuck on TPN. As long as she is on this course we will have to stay here. Things will eventually turn around I just have no idea how long it will take to get her going again. The removal of the drain tube will be huge when that can occur. My plan today is to keep the room as quiet as possible and to try and soothe her enough to get her to sleep. The lights are down, the music is playing, our "candle"(thank you so much "cheerful giver") is glowing. If she sleeps then I will begin a new book by Max. Low key is the plan outside of our trip to CT.
Sandra, thanks so much for all you have done. The quarters have made my life so much easier. You have been a blessing. Krista, please tell the girls thank you from Ash. We loved their gift! Brent and Darlene, what a great idea for her crib. The lights are glowing as I type and I thank you so much for the package. The socks are adorable! Jule, the mask is perfect! I am sleeping so much better, and the laundry burden is so much lighter. Thank you my friend. Glenda, Thank you. You put a huge smile on both of our faces. Dee, I can't thank you enough for the meals. It has been wonderful to have something home made for a change. For the many card and letters I say thank you. What a joy it is to receive mail from you and to hear how God is using Ashley Kate in you lives. Thank you for caring and for praying. Amy, I would love to receive the CD you have put together. What a blessing. Many have asked what Ashley is allowed to have and not allowed to have. The only thing I know that we can not receive are plants, flowers, or latex balloons. Thank you for your interest in making her days bright. You are all so loved. The quality and the sound of this clip isn't that great, but the vision of Ash actually playing is the best. I was so thankful to look over and see that she had picked up Blue and was shaking her and loving her and playing with her. That's progress! If you look close enough you will see a grin on that face. It doesn't last long, but it is there. Little by little she begins to get her strength back. I really believe that it won't be long until we are allowed to start feeding this little one and then watch out cause we'll be ready to go home. I can't wait! So the little camera thing is going to take some work. I am clue less! I was really, really trying. I did manage to get it to work for a few moments. Long enough for me to see those amazing people I get to call my kids. They are truly fabulous. I love them not only because they are my kids, but because they are incredible people. If you don't know them then I think it is easy to criticize us and our decisions, but if you do know our Blake and Allison then I don't need to go any further. God has really prepared their hearts and without the work He has done in them all these years they would be struggling. His plan for our family is precious and I am so grateful to be a part of it. Dave and the kids are coming to visit. I am so excited I can hardly stand it. They will be traveling all night Tuesday and arriving in the early morning hours of Wednesday. They get to stay until Friday around noon, and then they will fly home. I am really looking forward to seeing them, hugging them, and loving on them. I can't wait to sit up late into the night catching up on all that is going on with each of them. Ash and I miss them so much. ... you don't succeed, then try, try again. I continued working with Ash all day. Trying and trying to get her to feel like getting up. We had a bath, shampooed, dressed, fixed her hair and this is all she felt like doing. ... for about an hour. Now she has returned to her original position, but still I was encouraged by the way she looked once she was up. She really wants that drain tube out of her side. It is causing her to be uncomfortable and I am having to wrestle her and keep her hands occupied. She is still draining fluid. Still throwing up. Still feeling kind of yucky, but I think she is beautiful. We are looking forward to visiting with the kids before bed tonight and allowing them to see our baby gherkin. Hopefully she will enjoy the experience. So sorry if you have been worried. Sometimes the connection around here is difficult to hang on to. I attempt to post and it disappears because my connection has been lost in the writing of it. Thank you for your patience. I wake up each day and just keep trying. Trying to hang on to some kind of routine. Trying to help Ash feel better. Trying to stay positive. Trying to be connected to the things at home. Trying to keep up with the laundry. Trying to pull myself together. Trying to be a better me. Then there are days like today when all of the "trying" just become a little "trying". Trying to throw myself together with a ten minute shower, no electricity any where near the mirror, and a half done make up job because I have lost the last shade of the tan I showed up with. When you feel yucky, your day is... yucky. Today I definitely feel yucky. My hair is too long. My roots are in desperate need of some color. I am still walking around with 6 nails on and 4 nails off. My feet are aching for a pedicure and there is just no pulling myself together when I feel like this. How I wish I were one of those always "put together" wives or moms. The truth is that in the best of circumstances it takes a lot of work, and I still don't achieve that "put together" look. A hospital room is not conducive to working magic on this run down, over weight, thirty something mommy. I am afraid I am not very good at being a "stay at home/hospital mom". I wasn't blessed with the face, hair, or body that can pull this thing off flawlessly(although some others do). The good news is that Dave is 700 miles away and he doesn't have to know how bad I look. Oh, yeah the camera came yesterday. That 700 mile away thing isn't going to work for me any more. We hooked it up last night and it scared me. There I was looking at the face of this incredible man that I get to call my husband and there he was looking back at me. Tired, wrinkled, gray, and not so attractive anymore. What now? Now is when real life kicks in and those marriage vows are being put to the test. He has to look deep inside my heart to find the inner beauty that resides there and try to love that enough to look past the "shell' that I have allowed to crack and fall apart. Heaven help him cause he is going to need it! Ashley Kate on the other hand looks great. She doesn't feel great, but her color is amazing. Her cheeks are rosy and her skin always glows with that natural tan she was born with. She too is trying to pull her self together, but that chest tube is making it a little difficult. She doesn't feel good enough to sit up today and she half heartily tried to hold a toy or two, but gave up. They are keeping her on the dry side and that makes her feel yucky and miserable, but her chest tube is still putting out too much fluid. Another 180ccs have found their way out of that left lung. We will not be moving out of the PICU until the tube is removed. The tube will not be removed until the amount of fluid exiting her chest becomes a normal, reasonable amount. For now she lays in the bed getting lazier by the day because she just can't get herself pulled together either. I rub her feet and exercise her little legs while she lays still. I sing songs and make her hands and arms do the motions with me trying to give her some sort of movement, but she doesn't really appreciate me for that. I keep trying with her anyway. Its just one of those "trying" days for us here in Omaha. Longing to be home, to be outside, to be anywhere but here. I guess its on days like today that trying to find the part of His plan that needs to be fulfilled in my life gets a little "trying". I used to wonder "why me"? Out of all the mommies in the world why me? He could have picked anyone, but for some reason He picked me. I think I'm learning a little more each day why He chose me. I believe He chose me because I could not have looked upon the face of this tiny miracle and walked away. Nothing in this world could have made me. I loved her. I wanted her. I prayed for her. I would never say to Him, "Oh no, Lord. Not this child. I couldn't love this one." He had been preparing my heart for her. For our Ashley. Many, many years before she was even born. I used to think that anyone would have loved her. I used to believe that if she were offered to any mom out there that they would do what I have done. I don't believe that anymore. It breaks my heart to know that there are a few people who look at my daughter and see no value. Nothing worth loving. Nothing worth fighting for. Nothing worth giving life to. Oh my goodness you would have missed out had He offered her to you and you chose to walk away. Oh my goodness the world would have missed out if it did not have her in it. Ashley Kate is worth every moment of every struggle. Her life is valuable and He alone gave it to her. He alone preserves it. He alone will choose when to take it. Nothing I have done, will do, or hope to do will extend it for one more moment, one more breath, one more heart beat. Why me? Because He loved me. Why me? Because I am blessed. Why me? Because He heard my cry. Why me? Because He wanted to give me the desires of my heart. Why me? Because He has a plan for me and for my family and for my sweet Ashley Kate. Why me? Because my heart was and is willing to love on a miracle. Dave and I know that we were called to be her parents from the moment she was "knit together". Broken or not. Perfect or not. Valued by the world or not. She was born to be our daughter. She was born to complete our family. She was born to bring glory to God. I am so thankful the Father thought of me. So thankful the Father created her. So thankful He sees her differently than the world sees her. She is priceless! So valuable to the heart of her Creator and to the hearts of our family. It s my privilege to share her story with each one of you. Thank you for seeing the value in our baby's life. Thank you for loving her. Thank you for loving Him. ... this is a crazy way to live! We are on day 30 of this current hospital stay and I would like to say that I think it is going to be ok. I know it seems as though we are on this unpredictable path that takes us on extreme highs and lows, but I really think we are going to be ok.
Ash looks better today. We have successfully removed around 520ccs of fluid off of her left lung. When you divide that out you may be as shocked as I was to learn that it equals a little more than 17 fluid ounces. Yikes! thats more than a diet coke sitting on my baby's left lung. No wonder she is struggling to breathe. Her chest x-ray looks better today and we hope to be able to remove her drain by tomorrow. I also hope to be moving back up to the floor tomorrow. They make no promises around here, but as long as her lung is no longer compromised we should be safe to live up stairs. She continues needing oxygen support, but I hope that doesn't last for too much longer. We have a CT scheduled for Thursday to check on the bowel. By the weekend we would like to have a plan of action concerning feedings. I know we are having ups and downs. I know our emotions are all over the place. Some days I struggle to breathe along with Ash, and on others I feel like the turn around is coming. All I can say is that its tough to watch her go through all she does, but the joy that accompanies the good days is so complete. I know God gave her this spirit of joy and it spills out onto all of us. To know Ash on the good days and to watch her learn and accomplish more and more is indescribable. It feels just as huge as the hurt we experience for her on the bad. All of life is a give and take. He did not promise us this life would be easy. He was honest with us and told us we would have struggles and hurts and disappointments. What He did promise is that we would not have to endure them by ourselves. I have learned just how close He can feel when I need Him and just how far He can seem when I don't look for Him. I wouldn't trade places with anyone. She is an amazing little person and I love her more than I can express. What a gift I was given the day He picked me to be her mom. Its going to be a good day. I can just feel it. Some things you just don't ever get used to. I don't think I will ever get used to the empty space next to me in my bed when I lay down at night. Trish and I are best friends and we end every day by sharing what each of us did that day. It just doesn't seem right for Trish and Ash to not be here. I miss my girls and I know that they miss us. I now end my day by calling and catching us with Trish on her and Ashley's day, but it just isn't the same on the phone 700 miles apart. Today we spent some time trying to figure out the how and when we will be able to make the trip to Omaha. It is quite a challenge to work out the schedule. So far the best idea we have it to go during the week, but that poses its own set of problems. We will get if figured out and hopefully pretty soon. Trish tells me that Ashley had a little bit better day today, and those types of reports always make it a little bit easier for me. It is difficult to be here so far away and not be there to comfort my baby gherkin. So I am so grateful for the good reports. We received a box of goodies at the house today from "a cheerful giver" and it was such a blessing to the kids and I to open the box. It was a great surprise and another page in Ashley's Story that I am glad I got to learn from. It is amazing how such a small token of kindness from a complete stranger can teach me and my kids such important life lessons. I would like to say Thank You to "a cheerful giver." I pray you will be blessed as much as you blessed us. I am looking forward to getting the webcams set up so we can "be there" with Trish and Ashley and the can "be here" with us. I am looking forward to our nighttime routine being somewhat what it should be. I know that Trish is also looking forward to "tucking" the kids to bed even if it is done through a webcam. She should be getting it soon and we are all excited. I was out of town working this weekend so I was not able to see the journal entries. I was so very touched this morning when I was catching up and I saw over 100 comments on one of the posts. I know there are so many of you out there praying for Ashley and the rest of our family. So much so that sometimes I can actually feel your prayers. Thank you so much for being there for our Gherkin and our family. You prayers mean more to us than anything money could ever buy. We are blessed by each one of you. Thank You!! Ash is now back in her tent staring at her hands in the oddest way. I wonder what she is thinking? She could possibly be trying to figure out how to get them around my neck in order to strangle me for putting her through this. Just a thought? She looks really good and she did really well. We have a wonderful surgeon and I appreciate her care and concern for not only my Ashley Kate but for our whole family. She never fails to ask when Dave will be returning or how the older kids are. As she was setting up for the procedure we were visiting and I made this statement, "I really think the Lord must be trying to help me work on my trust and fear issues." She just smiled and nodded. She knows I have trust issues when it comes to Ash, and she also knows one of my biggest fears is the bedside procedure of sliding drains and needles in to tap out fluid. I keep hoping it will get easier, but it never does. When it was over I said, "Its a good thing her mom is so brave!" To which we all laughed because everyone knows what a wimp I am when it comes to Ash. Ashley Kate is the tough one who continues to pull me along. I really do admire this little person. Her chest x-ray is already showing some improvement concerning the fluid, but it also shows that there is a pocket of air between the lung and the plural cavity. We are hooking her up to suction in hopes that it will help. The air outside the lung is compressing on the lung making it harder for her lung to inflate. This can lead to problems with her heart function. We did another echo on the heart and the amount of fluid around it is unchanged. If things go the way we all would like then once the lung has drained the fluid around her heart will be able to find some place else to go too. Its a tense situation and it seems as though nothing with Ash is ever easy. We still have no idea why this happens to Ash. I asked if they had any theories and they said they could make something up to tell me, but it would only be made up. So to be honest it is best to say that we don't know why her body does these things. Our job is to help support her through them and by going after the fluid (even though it is frightening) we have the best chance at helping her. I still have not unpacked my things. I'm holding out hope for those drastic changes that will allow us to move back out of the PICU. Once we are over this respiratory issue then I want to go back to working on that bowel and getting it fed so we can move home. These are my goals. Thank you again for your prayers. Your support is so comforting. Just knowing that I can ask for your help in praying for Ashley Kate encourages my heart. Wendy, thank you for the gift. It is beautiful and one day I hope to be removing it from my neck and placing it around Ashley Kate's. Karen and Robin thank you for the yummy surprises, and Aunt Kathy, Ashley is forever grateful for finding her "friend". You are all loved and appreciated. Take care and God Bless. Ashley's surgeon just came in and said they would like to attempt another tap and drain. Please pray for our little pickle. She is so exhausted and has been sleeping for most of today. She has no idea what they have in store for her. The ultrasound and x ray show us that Ash's lung is completely full of of fluid again, and she is moving no air through it at all. I will never understand the whys of all that goes on in Ash's life. I could ask a million questions,but it wouldn't do any good. The best way I know how to cope during the tough times is just to trust. I can do no more. My hands are shaking and my heart is pounding because I know how fragile she is . Just like with most things that are fragile, she is just as valuable. Our family would not be the same without her in it. She isn't thrilled about the whole camping thing. Princess' don't camp. She wears hair bows, and outfits, and lacy socks. She doesn't lay naked under a tent with no hair brush. She just looks really ticked off to me. I have to smile about it otherwise we would start to cry. I know the tent looks ugly and doesn't look like much fun, but it is a huge blessing. Ash HATES to have anything taped to her face. She won't wear a cannula or mask. Our only option to help her breathe during this ugly fluid episode is a tent or a ventilator. Guess who signed her up for this camping excursion? You guessed it. It was me. She and I had a long talk this morning. She knows how much I love her, and she knows that I agree this stuff isn't fair. She also knows that if this is the road that leads us home then we are going to take it. I would rather not be battling respiratory issues again, but this is where we are for today and no matter how much I cry or stomp or complain it won't change. We might as well look at the positives and so far the biggest one is that she is still not on the vent. I'll take that any day. All of today's trouble was just a warm up of what tomorrow may bring. I can't believe what I am going to share with you now. In just two short hours Ashley's chest tube was pulled out. How? We have no idea. They ordered an x- ray to see how much fluid remained and by 9:30 the film showed that the drain tube was no longer inserted into her lung. I can't describe to you how frustrated and defeated I felt at that moment. The resident came down and told me he wanted to remove the dressing in order to get a good look at the site. I refused. No thank you. She has been through enough tonight. There was no way I was about to let him remove that dressing, pull out those stitches and the tube. Not tonight. She is in no danger from it remaining under the skin and I would like for her to be left alone. So now my sweet Ashley lays sleeping under her oxygen tent. Sleeping until they come in for another set of vitals. She has until 2a.m. and then up she will be once again. Under the tent she is at 98% oxygen saturation. The highest she has been all day. Her heart rate is lingering in the 150's and after a day like this that is a relaxed rate. After speaking with the doctor who is on tonight I learned that the fluid is already re accumulating in Ash's lung. Where is it coming from is what I would like to know. They have no idea. The thought of putting her through this procedure again in the morning makes my head spin. I am so discouraged. They may take her into the OR in order to get a better look and better position. I don't even know what to say. I am numb. Ash continues to run a fever and vomit. She has a nasty cough that seems to bring on the episodes. She just doesn't feel good tonight. I guess if I were looking for the positives from today's situation I would find: 1. We were able to pull of 200ccs of fluid. 2. We were able to avoid the ventilator(so far. The doctor tonight says he won't be surprised if she in on by morning). 3. God has blessed me with friends who are willing to go out of their way for me on what proved to be a very long and trying day. All in all we are still blessed. I am so tired. My feet and back are hurting from standing next to her bed for 11 or so hours today. I have finally taken a shower and am now ready to sit next to her crib and try to close my eyes. I pray tomorrow brings us good news and not the expected course. Have I told you lately how very much we miss home? Ash and I want to go there more than anything. Tonight makes 4 weeks since she has been in her own crib in the nursery and 4 weeks since I have laid next to Dave holding his hand underneath our pillows. How I wish we were surrounded by Blake and Allie and Dave tonight. When I close my eyes I see their faces and I dream of being home again. Perhaps tonight will be no different.